Favorite class to teach: So far the Neapolitan Pizzeria class. It's the perfect blend of fun and lots of opportunities for in-depth discussion. Training/education: Self taught through books and YouTube. Favorite childhood food experience: Probably just the time my parents invested in making sure my sister and I had good, nutritious food growing up. It's easy to overlook as a kid, but in hindsight I'm very thankful that my parents took the time to teach me to make scrambled eggs, or chicken cutlets, or lemon bars, or any number of other things. Even if it meant I didn't get to taste Lucky Charms until I was in college. What made you want to become a chef? Cooking has been the only thing in my life, that no matter what else is going on I can't not do. It's the ideal combination of creativity, technique, design, gadget geekery, science, and hedonism that just makes it irresistible to my personality. What is your signature dish? Can't say that I really have one, but I made a killer batch of carnitas yesterday. What are the 5 ingredients you can't live without? Salt, maple syrup, really good wheat flour, peak season strawberries, milk and its derived products. What do you love about cooking? Having delicious food at the end. When you're creating a new recipe, what influences and inspires you? Mostly the food that my peers are making. I use Instagram to keep up with chefs all over the world, so I can see what my friends or the chefs I admire are working on. That combined with whatever food is at the peak of its season often inform my ideas. What advice would you give a new cook? Have confidence. Success in cooking is at least 50% confidence. What are you doing when you're not cooking? Planning my next meal. Describe your perfect evening. A beautiful meal with good friends where someone else cooks. If you had friends in from out of town, where would you take them to eat? Fat Rice, Maxwell St. Market, Spinning J's, Qing Xiang Yuan, Fatso's Last Stand and Smyth if we were going somewhere fancy. What was your favorite vacation? Camping on a lake in the Adirondacks with a bunch of my friends that I don't get to see very often, cooking over fire for five days. What is your favorite sports team? I don't really follow sports, so whatever the favorite team of the people around me happens to be. Who is your favorite celebrity chef? At the moment it would probably be Dominique Crenn. She's making some of the most beautiful and compelling food on the planet, and doing the hard work of detoxifying the restaurant industry. 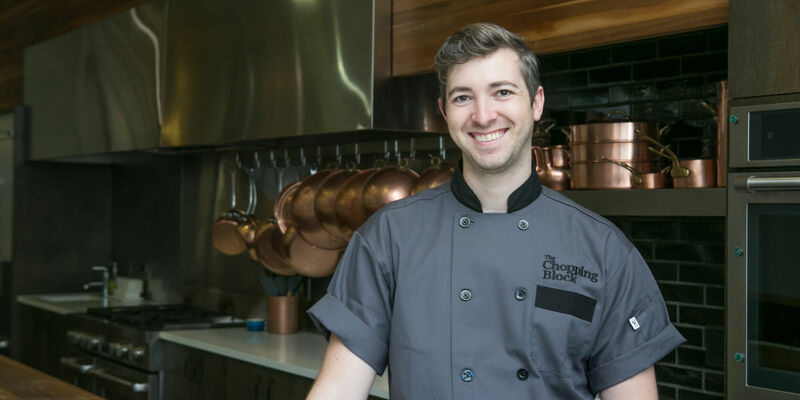 What resources would you suggest for Chopping Block clients? If they are into the history and science of food the book "On Food and Cooking" is a timeless must-read. The T.V. Shows "Good Eats" and "In Search of Perfection" are great ways to learn the ins and outs of basic to advanced home cooking. Mounting butter into sauces or to finish pasta dishes, or stews is one of the easiest ways to take home cooked food to the next level. Fish sauce is an amazing way to add an extra layer of flavor to any savory dish. I don't just use it for SE Asian dishes, I use it for bolognese, Chili, anything where I need to add salt and a hit of umami. Maintaining a sharp knife is the best kitchen tip I've got. When your knife is sharp, it's a pleasure to use, and you'll find yourself wanting to cook more just so you can use it. Not to mention it's way safer. 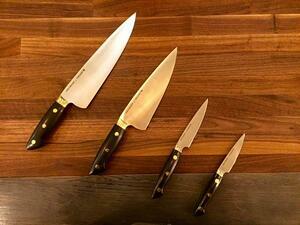 I love the Kramer/Zwilling carbon steel line of knives. The 10" chef's knife was the first knife I ever bought for myself, and I still love it 8 years later. They are expensive, but worth every penny, and nobody else carries them.